Right before Winter Break I realized that I’d be coming back to both a new year and a new session with my early childhood classes. Which meant a new lesson plan was in order. I had some time to think and plan for it, so it fell to the back burner. 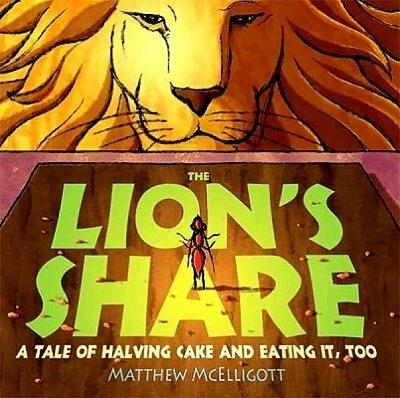 As I wandered through Google to find the perfect book to use to teach emotions to a student with social needs, I stumbled on The Lion’s Share and immediately switched gears to focus on early childhood. Animal characters to turn into yoga poses, an ethics lesson in greed and sharing, and a totally fun story to engage the kids. And to take it even one step further - the story lent itself perfectly to a simple introduction of fractions (halving) and doubling. I chose just one simple game to do with the kids as you’ll see in the below lesson plan, but there are a myriad of activities that tie in beautifully with this book. A few additional ideas are included below, but I’m sure you could come up with tons of others. With the really little kids (3-4 year olds) I only used the halves of cake for the activity, but for the older kids (4-5) I used halves, thirds, and fourths. The kids all loved the game and kept asking to play it again and again. From the get-go, this is probably one of my more successfully yoga/literacy lesson plans, and ranks right on up there with Chalk (lesson plan) as a kid favorite. One more idea not listed below that would be fun to try is to actually incorporate the yoga/meditation into the math lesson. Each student could become a “piece of cake.” Have an even number of students lay down with the heads towards the center of a circle. Choose the same amount of students to lay down with their feet going towards the circle, and have everyone join hands. Take a minute and have the kids close their eyes and do a mini-meditation. Afterwards, have the remaining students count the number of “pieces” and then figure out how many people could share the cake evenly. This lesson plan could be easily adapted for older kids, and I may try to collaborate with my friend who teaches 4th grade to figure out a way to work it into their math curriculum. If so, I will definitely post the results here.